When innocent, wealthy Nora Marlowe came to visit the Wild West, she was as wide-open to adventure as the vast Texas horizon. Its rugged individualism - and dashing cowboys - suited her romantic spirit. That is, until the wrong cowboy decided to take the elegant heiress down a notch! Cal Barton didn't like haughty Eastern misses. And he certainly didn't appreciate one invading the ranch where he worked. But something about Nora was irresistible. 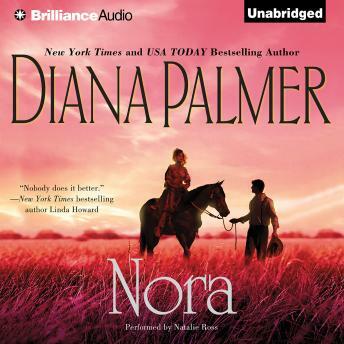 The pull between them only grew stronger the longer she stayed - until a simple kiss became a full-fledged seduction that threatened to destroy everything she held dear.... Don't miss this classic tale from Diana Palmer! I really enjoyed this book. The narrator was good but the male voices were distracting but not enough to spoil the book. This is my favorite kind of romance. it had it all - strong characters, some history in a good setting and a fast moving story. I was not bored.